The Lake Annecy area has to be one of my favourite places. Lac d’Annecy itself is the third largest lake in France with a surface area of 27.59 sq.km. and has very clean water. Annecy itself is a bustling town and the administrative capital of the department, Haute Savoie. It is 50km from Chambery and only 40km south of Geneva. 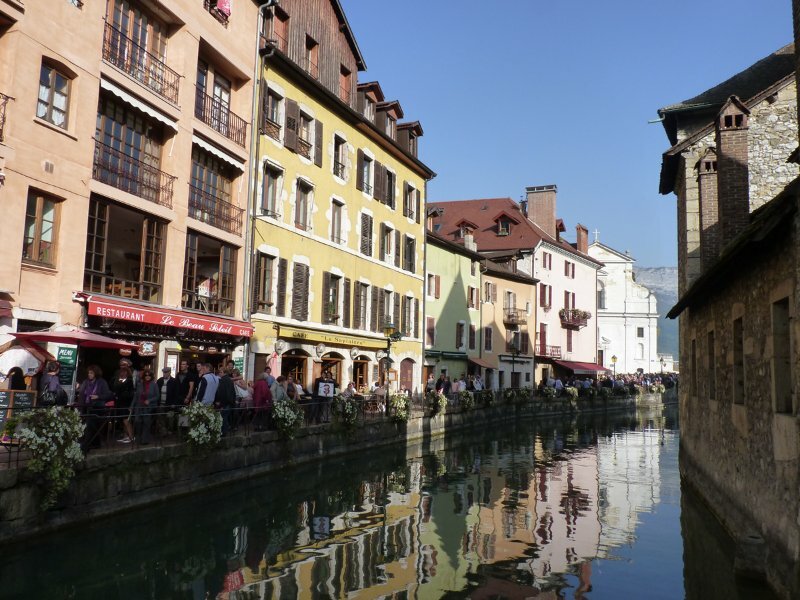 Annecy is sometimes known as the “Venice of the North”. The medieval part of Annecy that adjoins the lake is traversed by the river Thiou. The narrow old streets with “hidden” passages is a labyrinth of shops, bars and restaurants. Talloires is very pretty and if you want to spoil yourself a visit to Pere Bise’s Michelin starred restaurant right on the lake-side. Over-looking Lac d’Annecy to the east is the edge of the Aravis mountain range. Along the eastern shores there are the mountains of Mont Veyrier, Les Dents de Lanfon and La Tournette (2351m) overlook the lake. The principal road on this side goes through Veyrier-du-Lac, Menthon-St-Bernard and Talloires. The West side of Lac d’Annecy is bounded by the “Parc naturel régional du Massif des Bauges”. The principal road along this side of the lake passes through Sevrier, St Jorioz and Duingt. At the end of the lake, known as the “Bout du Lac” there’s a nature reserve with a very pretty, sign-posted, short walk. The Bauges mountains, a limestone massif, is recognised as a GeoPark by UNESCO. The culminating point is Arcalod ( 2217m). Close to Annecy is the whale-back mountain of Le Semnoz, mainly tree covered, but the ridge is a great view point. In winter there are a couple of ski lifts and tracks for cross-country skiing. In summer herds of cows and goats roam amongst the alpine pastures. One of the most challenging walks close to the Lake is La Tournette ( 2351m). The starting point is usually accessed via the Col de la Forclaz and then by a rough track to a farm; the Chalet de l’Aulp. The farm also has a cafe and you can buy their cheeses too. From here a steep path sets off from here passing through an initial exposed traverse before reaching the Refuge de la Tournette. More easy scrambling and grassier slopes lead to the final section to the summit “block” which is protected by chains and a short ladder takes you to the summit. A superb panorama awaits you. There’s plenty of easier walking too. Short rambles to longer walks either in the Aravis or in the Bauges. You can find out more about my walks based around Lac d’Annecy and the Bauges on my website. If you enjoy swimming Lac d’Annecy is a wonderful spot. The water temperature can reach the low 20’s in summer. There are a number of “beaches” where swimming is under the watchful eye of lifeguards within marked areas. You can of course swim elsewhere but at your own risk. On the west side of the lake the old railway line has been converted into a great cycle path that runs the full length of the lake. The cycle path is also shared by people on roller skates and even roller skis and the odd pedestrian too; so you need to be attentive. The east side of the lake is less easy for cyclists although there’s on-going works to increase the amount of cycle path. I tend to start on the East side from Doussard in the morning before the traffic increases. Near St Bernard it’s possible to take small backroads between the main road and the lake to avoid cycling with the traffic. You are likely to see lots of paragliders flying here is the summer months as it’s one of the premier flying sites in France. If you would like to see what it is like you can take a flight with a professionally qualified instructor. There are many paragliding schools particularly near Echarvines above Talloires. There are two golf courses in the area, one at Talloires and the other at Giez; on the way to Ugine. Previous Post: « British Ski Instructors not welcome in the French Alps? Not True!